Time for YOU to write what YOU want to write! Click here for some creative writing prompts. My goals as your English teacher this year have been to teach you about great writing, to help you become life-long writers, and to assist each of you as you discover your unique voice. This mini-unit is designed to help you do that. The Lifelong Writer Project is going to be different for each of you. You will be writing on topics of your choice in genres of your choice, working at your own pace and to the best of your ability. By the end of this unit, it is my hope that each of you will have a small portfolio of writing which will be a true reflection of your unique voice. 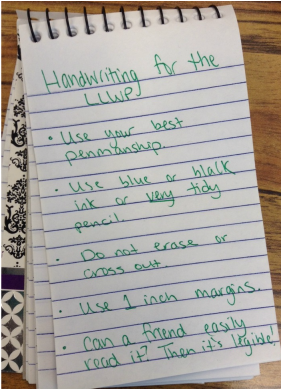 A conference with me to discuss your plan and progress in completing the LLWP. A peer conferences on one piece of writing..
A minimum of 50 points worth of writing in published, final copy, error-free form. A maintained atmosphere of creativity, academic discipline and respectfulness during our writing time, peer workshop, and student/teacher conferences. This includes participation in free-writing activities many days to get your ideas flowing.